We typically think of stars and planets as very different types of objects. While it’s true that the Sun and Earth are clearly different, the line between the largest of planets and smallest of stars is a bit fuzzy. 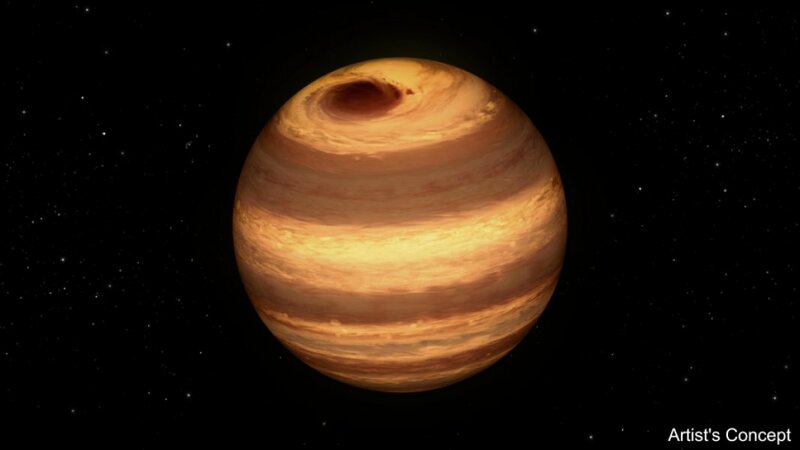 An interesting demonstration of this is a newly discovered storm (similar to Jupiter’s great red spot) on an object that some consider a star. 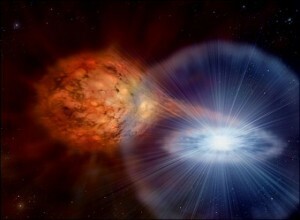 The object in question is known as W1906+40, and it is an L-dwarf. The usual definition of a star is that it must fuse elements in its core. Objects larger than about 78 Jupiter masses have enough mass to fuse hydrogen, and is a common dividing mass between red dwarf stars, and brown dwarfs. But objects between 65 and 78 Jupiter masses can fuse deuterium, and so are at least star-like in terms of fusion. An L-dwarf star is closest to a red dwarf. Though roughly the size of Jupiter, it they have surface temperatures around 2,000 Kelvin, and so would typically look rather star-like if we saw one close up. This particular L-dwarf is massive enough and old enough that it’s just on the edge of being a star. However with a surface temperature of 2,200 Kelvin it is still cool enough that it has an atmosphere rather than an ionized photosphere. As a result, weather patterns and storms can form, similar to the way they form on Jupiter. Observations of this star found evidence of a large dark spot near one of its poles. For a star this would be a starspot, driven by strong magnetic fields. But we can observe the effects of magnetic fields near starspots, and observations by the Spitzer infrared telescope found no corresponding magnetic field. So this dark region isn’t a starspot, but rather an atmospheric storm. It’s been supposed that brown dwarfs could have such storms on their surface, but this is the first observational indication that they actually occur. Now just put Pluto in orbit around one of these transitional objects and try to figure out if it’s a planet or not! The nuance of fusing deuterium vs hydrogen is something I didn’t know about until I read this.